A simple fact that you will need to cope up with is that your little one will always be a cargo. She will be such a precious cargo that you will always need to have her around you. No one can bear the weight of a newborn or a toddler on their back while for instance jogging. You will somehow need a helper to help you carry around your little one. A best car stroller combo will be a good helper to bet on. In today’s momentum defined world, time will not be on the side of even a newborn mom. You will need to compete with it. Owning the best car seat stroller combo will always put you on the competitive edge. The apparent reason for owning this kind of a stroller is that it will make getting your baby out of the car and onto the stroller become as easy as apple pie. If you are a regular baby gear shopper, you are familiar with Graco products. Graco Company will never disappoint with their brands. Graco FastAction is a stroller you will trust and entrust your baby with. From the name, it has a fast action fold feature that will be suitable for busy moms like you. This stroller also features a removable baby’s snug tray with a cup holder, a parent tray that you will store your belongings in such as your car keys. This stroller will give you extraordinary experience with your little one. - Graco’s top-rated snug ride click connects 35 infant car seat. - A FastAction fold system. - It has a removable baby tray and parent tray. - Self-locking front wheels with upgraded suspension. - Has a multi-position reclining seat. The fast action fold will provide ease and handiness to moms like you who are always on the go. The roomy basket will enable you to store your little one’s gear alongside your stuff as well. Not forgetting the child tray for holding your baby’s snug. You are not also left alone.You will have two cup holders to place your refreshments on the parent tray. This stroller is designed for your little one’s comfort. Your little one will be well positioned by the multi-position recline seat. It is firm and strong hence can accommodate the weight of up to 35 pounds. For those looking for a safe, convenient and guaranteed travel system stroller, this is it. The baby Trend has high maneuverability than other conventional stroller systems. It comes with a luxurious and thick padded car seat. Both the stroller and the car seat feature a 5-point safety harness that will offer your little ultimate protection. You don’t have to worry about how you will position your little one on the stroller system or the car seat; Baby Trend EZ Ride 5 got you covered. It comes with a multi-position recline and a multi purpose cushioned head support. This stroller has endless amazing features. - An adjustable height holder. - A canopy with a transparent peek-a-boo window. - Energy absorbing foam made car seat. - A 5- point harness to tightly hold your little one while you are strolling or travelling. - A multi purpose cushioned head support. The soft and thick padded car seat accommodates up to 30-pound little one. Your new born will be safe on it. This travel stroller system will guarantee your little one’s safety. It is fitted with a multi-positional recline and a multi purpose harness to hold your little one in position. The canopy will perfectly shade your little one. And better yet, you will be able to monitor your little one through the transparent window. This three-wheeled stroller will provide you with the utmost maneuverability through your neighborhood terrains. Your little one’s comfort is guaranteed with this stroller, thanks to the large thick and affluent head support. The well-covered parent trays will hold your water. Don’t also forget the large side basket that will hold your baby’s changing gear and even toys. There are complaints about low-quality frames and falling front cup holders. If you love travelling, this the best car seat stroller for you. It only weighs around 30 pounds and is very easy to maneuver. What’s more, it comes with a very fantastic car seat. It is sturdy, convenient and above all safe for your little one. Your child will love being on this one. The click connects feature will alert you if your child is safely buckled. Simply think of this stroller as a scooter, the only difference is that you are the engine. Its air-filled rubber wheels will beat any terrain. If you love listening to music while strolling, you will have your smartphone along not on you but the stroller. - Comes with a highly rated Graco snug ride click to bugle 35 infant car seat. - A fast action fold. - Storage unit along with parent trays. It is lightweight, weighs only 30 pounds making light to store and place it on your car. The click connects feature will always alert you if your little one is safely placed on the seat. This stroller will offer you and your baby a comfortable ride. The air filled wheels will provide an excellent suspension and stability. The padded seat will provide your little one maximum comfort. The multi-position recline will allow you to position your baby accordingly. This scooter-like stroller has great maneuverability. The canopy will provide shade for your little one from the sharp morning, daytime or evening sun rays. It is huge and somehow heavy. Using it during the jogging time will be hard. Forget the complexity that comes with most of these strollers. 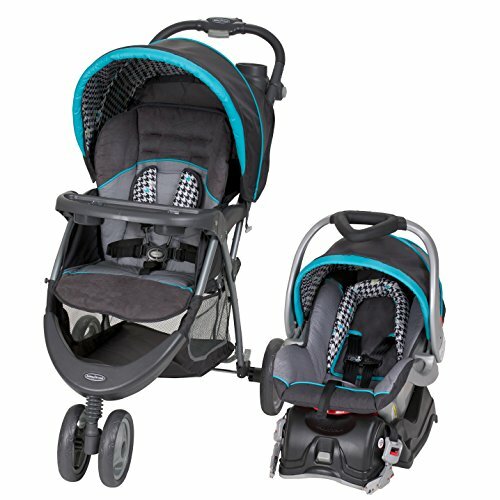 Chicco Bravo Trio Travel system is a sturdy and compact travel system. It is compact with a staged design that will suit your child at both the infant and toddler stages. The key fit feature will ensure that your child enjoys maximum comfort. It is portable and lightweight. You will cruise through your busy day’s schedule both at home and outdoors with the greatest maneuverability and ease. When your child is not riding the stroller, it is made in such a way that you can easily fold it, and parts of the stroller will fit into each other perfectly well. The front wheels will be left out while the rear wheels will swivel and perfectly fit between the front wheels. This can allow you to ride it using one hand. - A commodious parent tray that comes with two cup holders. - Auto-swivel rear wheels and front wheels. - One hand fold feature. 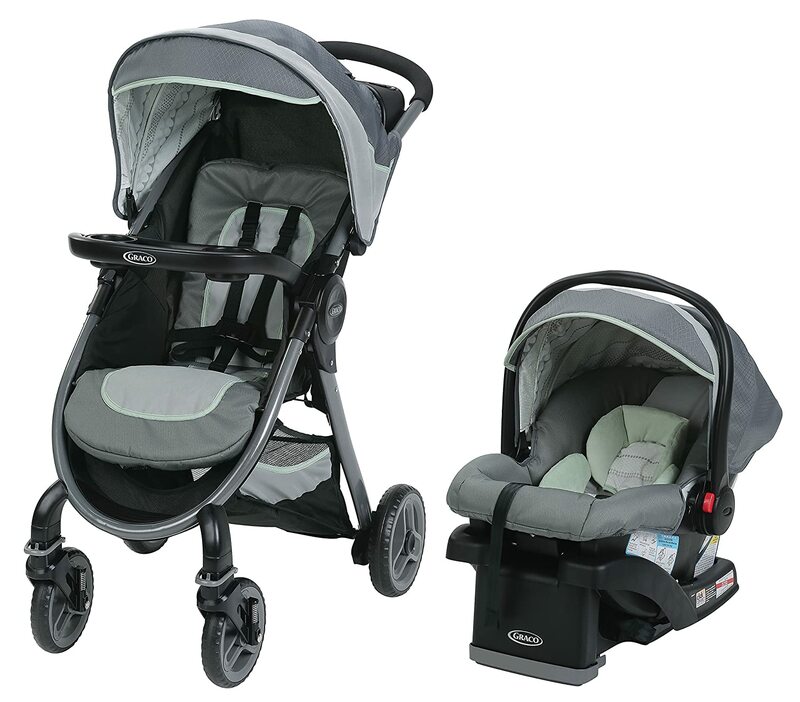 Chicco Bravo Trio Travel system has a removable car seat that will transform this stroller to a lightweight key fit carrier. This stroller comes with an adapter that will enable you to click the seat into position. A plus for your little one’s safety. 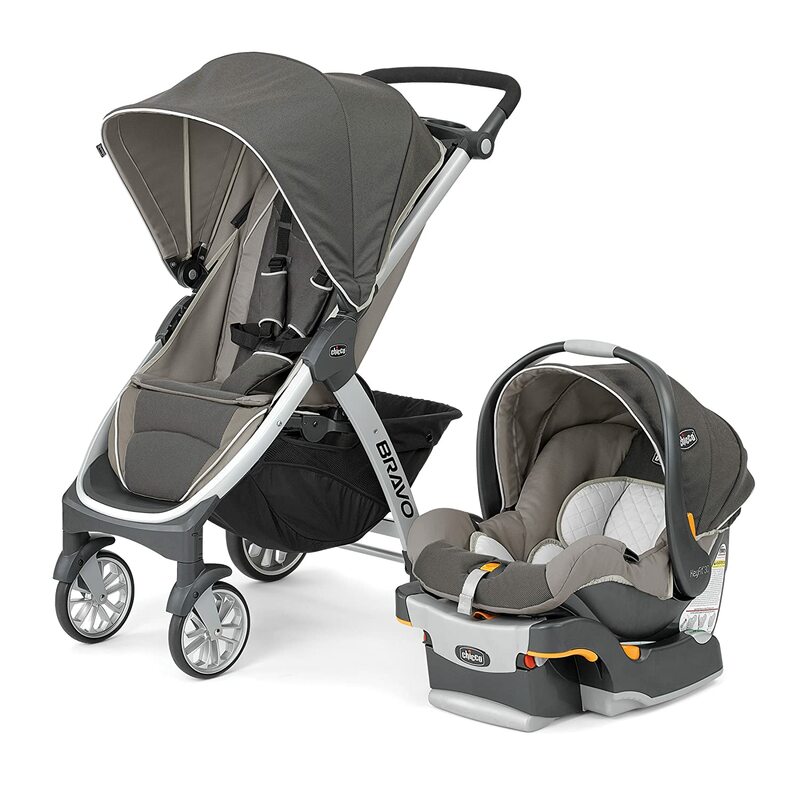 The canopy and the multi-position recline will give your baby a comfy ride. You will love the one hand fold feature. It will ease storage and car to house shifting. The extra-large storage unit beneath the car seat and the parent tray will be necessary for storing your little one’s essentials. Its wheels might be clumsy making it hard to move on crowded pavements. Graco Aire3 wins when it comes to travelling. It comes with a top rated snug ride click connect 35 infant car seat. The rear-facing, 4 to 35 pounds and up to 32 inches accommodating car seat is specially designed with your baby’s safety in mind. If you are those “in a hurry” type of parents, the click to connect system will always help you safely connect the car seat to the stroller within no time. Forget the cumbersomeness; you can fold this stroller with one hand while carrying your little one on the other hand. - A parent tray and two cup holders. - A large storage basket. - It is 3-wheeled with great suspension. - Removable armrest bar for your baby. - The sturdy stroller can hold up to 50 pounds. - Versatile 3 & 5-point harness. With your busy day to day errands, your little one will enjoy ultimate comfort on this stroller. The easy to fold feature will ease portability from your house to the car. The 3 wheels will provide ease of maneuverability and suspension creating convenience and efficiency for you. You will have a large basket to store your little one’s essentials. It has a mom’s and daddy’s tray with two cup holders. It is also zippered to hold belongings like keys and phones. It cannot stand on its own in folded position. With the great excitations that come with being new parents, most parents don’t take their time to buy the best car seat stroller combo for their newborns. We believe however that with this premier at your disposal, you will be able to beat the excitation and own a lasting, all-in-one and convenient stroller combo like Graco FastAction 2.0 Travel System, Mason. This is the one we have highly recommended though the other four can still work best for you. Your baby’s happiness lies with you now; please use the information that we have shared with you to make her enjoy her childhood from the moment she is born. An all-inclusive travel system consists of the stroller, an infant car seat and the car seat base. 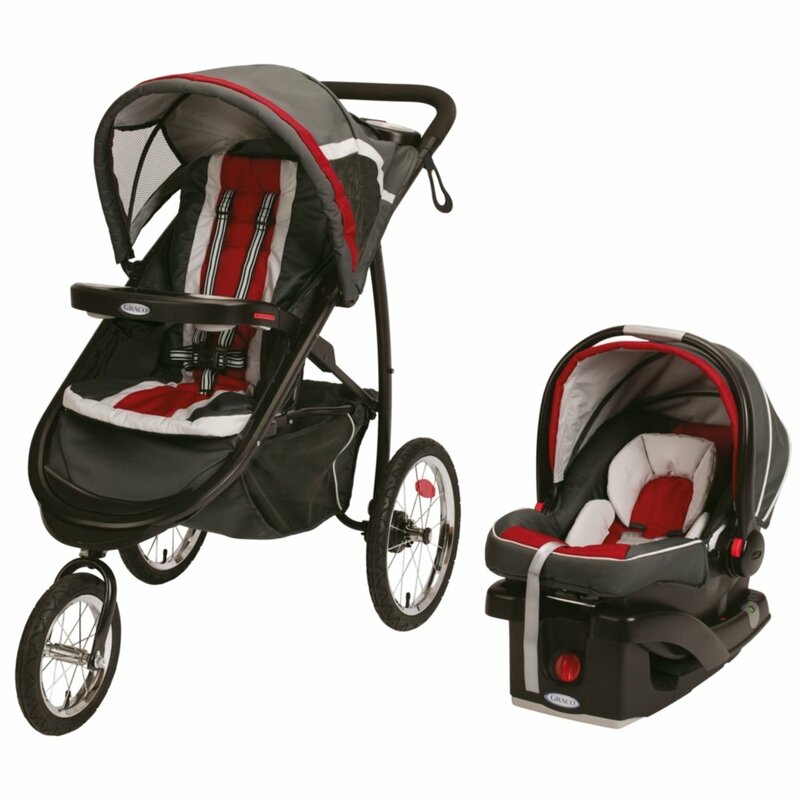 Most parents consider having all-in-one strollers because of the nature of their daily lives. An all-in-one stroller will be suitable for new parents and parents who are always on the go. Before your little one becomes responsible and able to buckle themselves into their car seat, you will always be required to have an infant car seat. This means that you will always carry it around. Having a light car seat will be wise. It will be portable and will ease your day to day activities. A good stroller travel system should be quick in maneuvering the busy city sub way and pavements. 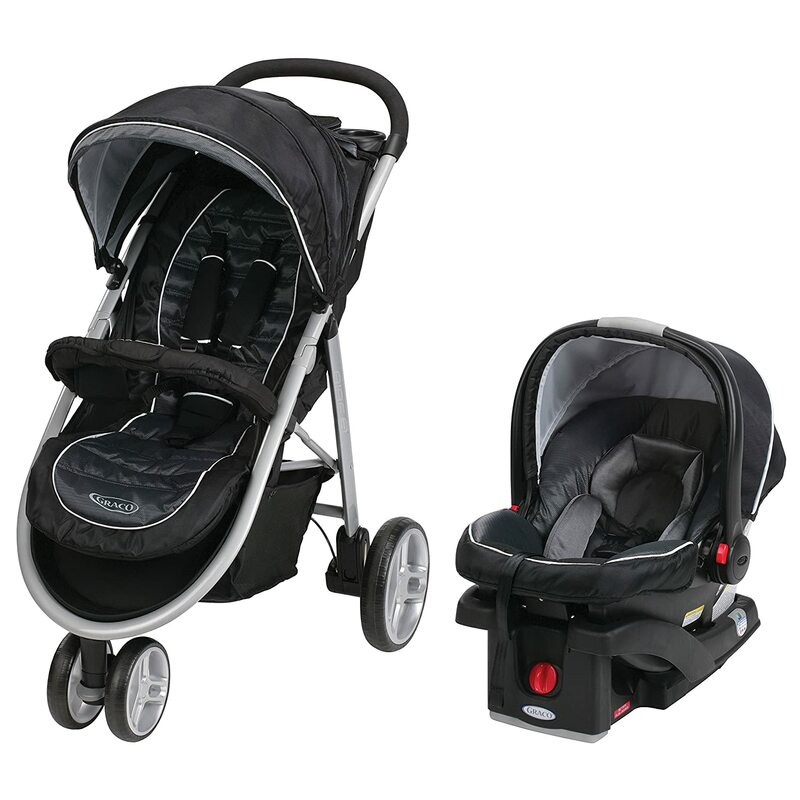 A lightweight stroller, with good wheels and suspension, will maneuver well and ease your walking time. A stroller is supposed to be a useful carrier. It means you will always need it with you. There will be days you will need to fold it. This is so that you can carry it in your car or even in a public vehicle. How fast it will be to fold it and convenience in converting it into a portable stroller will be very important. You should be able to carry your little one’s essential changing gear with you. A good stroller travel system should have a storage basket so that you can store your belongings as well as your baby’s belongings. Comfort: First, a stroller combo will aid you in carrying your little one around. And secondly, it will provide your little one with a handy comfort. This comfort will be better than what she could have received while on your back. Convenience: Owning a car seat stroller combo will assure you convenient jogging time and time-saving during the busy business days. Longevity: Stroller combos are among the most durable baby products you will ever buy. 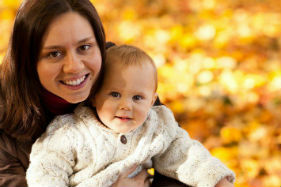 Advanced Child Safety: With your child on a stroller combo or the car seat, she will always have an assured safety. They come with advanced positioning reclines, safety belts and top notch safety locking systems. Stroller wheels and other movable parts need to be lubricated. This is to reduce wear, tear, increase mobility and maneuverability. Use a sponge, clean soapy warm water to clean plastics, harness, belts, and latch hardware and straps. Always leave the metallic parts dry to prevent rust. Check the car seats for regulations. Some are FAA approved, meaning that they are used for airplane travel. Read the manufacturer’s instructions about cleaning fabrics in your stroller combo. Did you know that car seats expire? They expire 6 years from when they were made. Make sure to read the labels for the date of manufacturing.